This means you can consume any contents from your Galaxy S4 on a TV with a bigger screen with screen mirroring. For example, you can watch any videos on the TV screen from Galaxy S4. This usually gives better watching experience. You can easily share the video or the show with your family members in the living room with a bigger screen. With Galaxy S4 screen mirroring, you can also play games on your TV screen. Your Samsung galaxy S4 is your controller and the storage of your games. In other words, any games you can play in your Galaxy S4 can now be played on the TV screen. Isn’t it cool? You can also use Galaxy S4 screen mirroring to show photos taken or saved in your smartphone on the TV for other family members or friends during a gathering. Everybody knows it is painful when there are 10 eyes staring at the 5″ screen. Now you can share the Galaxy S4 screen to a TV so that everyone can enjoy the photos. Is only the screen mirrored? How about the audio? Although so far I only use “display” or “screen” for Galaxy S4 screen mirroring, actually sound/audio will also be mirrored (to be precisely, transferred). Galaxy S4 Screen mirroring is not just for mirroring the screen ( screen sharing ): it shares and casts both display and audio to your TV. If you have a good sound system for your TV, you will immediately enjoy the excellent audio through Galaxy S4 screen mirroring. You will probably never want to watch movies in your Galaxy S4 at home any more. The sound quality is limited by the video file itself and your sound system, not by your Galaxy S4 (although the audio quality of Galaxy S4 is not bad). In fact, Galaxy S4 Screen mirroring never degrades the audio quality. Galaxy S4 screen mirroring uses the technology called Miracast, which allows a portable device or computer to send, securely through peer-to-peer WiFi Direct connection, up to 1080p HD video and 5.1 surround sound, to any devices that support Miracast. Galaxy S4 (including most of its variants) is Miracast-certified. Galaxy S4 screen mirroring complies with Miracast standard. This implies, for screen mirroring, Galaxy S4 works with all Miracast-certified devices. Miracast is officially supported by Android for Jelly bean 4.2 and later versions. Google and most other Android phone manufactures use the term wireless display (e.g., Wireless Display in Moto X). , which is essentially the screen mirroring in Samsung Galaxy S4. Before Miracast is officially supported by Android, Samsung supported Miracast through their proprietary implementation of AllShare Cast. You can find this option in some old flag-ship phones, for example, Galaxy S3, Galaxy Note 2, Galaxy Note 10.1. Galaxy S4 Screen mirroring is a natural evolution of AllShare Cast and Android’s wireless display. If you used AllSahre cast in some Samsung device before, Samsung Galaxy S4 screen mirroring is actually not new at all. All devices works with AllShare Cast should work perfectly with screen mirroring in Galaxy S4. To turn on Samsung Galaxy S4 screen mirroring is very simple. you just go to Settings–Connections–Screen Mirroring (maybe slightly different depending on your region). Drag it to right to turn it on. Drag it left to turn Galaxy S4 screen mirroring off (stop sharing screen). Once Samsung Galaxy S4 screen mirroring is turned on, Galaxy S4 will then scan for available devices that support Miracast within the range. Tap that device to connect to it following the on-screen instructions. So you need another device, usually a Miracast-supported TV, or a Miracast-supported HDMI dongle, to get the mirrored screen. Please read on to know what you need. What are required to use Galaxy S4 screen mirroring? Miracast is an industry-wide solution, so the technology works well across devices, regardless of brand and vendor. To use Samsung Galaxy S4 screen mirroring, you only need a Miracast-supported TV. Your Galaxy S4 will immediately find your TV once the screen mirroring is enabled. So, you can share your screen on the TV immediately after you start the Galaxy S4 screen mirroring. Most smart TVs released in last two years support Miracast. You may check the specifications of your TV. It is NOT a problem, even if your TV does not support Miracast. A HDMI port is the only requirement for your TV. Now, let’s explore these 3 options to help you decide the most feasible solution for your Galaxy S4 screen mirroring. There are quite a lot Miracast-supported HDMI Adapters in the market. Most of them will work with Galaxy S4. But not all of these HDMI adapters are created equal. The latency or the lagging is usually your primary concern. Some low-quality adapters may cause considerable lags when sharing the screen. Sometimes, the video and audio are even not synced. This will surely ruin your watching experience. Another factor you need consider is whether you want to use screen sharing or wireless display for other devices. Based on my own experience, I usually recommend Netgear Push2TV Wireless Display HDMI Adapter with Miracast. It works for all of my devices. This adapter works well with Samsung Galaxy S4 screen mirroring. When using it for Galaxy S4 screen mirroring, you will not feel any lagging. The audio is synced very well as well. This adapter is extremely useful if you have some non-Samsung smartphones or tablets at home, especially, Amazon Kindle Fire HD or Kindle Fire HDX tablets. It is even officially certified by Amazon for display mirroring with Kindle Fire HDX 7, Kindle Fire Hdx 8.9 and the new Kindle Fire HD. So, it is a good idea to get this adapter to enjoy Galaxy S4 screen mirroring or Kind Fire display mirroring . It works with most other Android phones with Jelly Bean 4.2 or newer as well, for example, Galaxy Note 3, HTC One, Nexus 4 and Moto X. This adapter also supports Intel Wireless Display (WiDi). This means you can use your TV as the second screen for your WiDi-supported laptop with this adapter. The price for this adapter is around $60. In the box, the USB power adapter is included. But surprisingly, HDMI cable is not include. When ordering this adapter, please make sure you get a HDMI cable if you do not have any spare cables at home. Samsung HomeSync is actually a personal cloud (1TB) with tons of features. Screen mirroring is only one of the features in the long, long feature list. For Samsung Galaxy S4 screen mirroring, this device is actually overshot. HomeSync is recommended when you also need personal storage cloud to save and share videos, music, and photos. It can also be used as a media player for your TV. Most Galaxy phones and tablets are supported by HomeSync. But screen mirroring is only available on Galaxy S3 (and some variants), Galaxy S4 (and some variants), Galaxy Note 2, Galaxy Note 3, Galaxy Grand, Galaxy note 10.1, Galaxy note 10.1 2014 edition, Galaxy Note 8.0, Galaxy Tab 3 (7.0, 8.0 and 10.1) . To fully utilize the HomeSync, you need download the free HomeSync app. The HomeSync is not cheap. 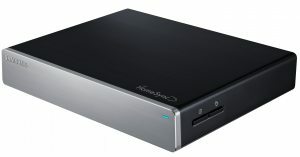 It will cost you around $300 (1TB). Samsung All-Share Cast Hub is another affordable solution if your TV does not support Miracast. The wireless adapter works with Galaxy phones with AllShare Cast capability. Of course, Galaxy S4 screen mirroring is officially supported. Please note, this AllShare Cast Hub is only for Samsung devices. It works nicely for Galaxy S4 screen mirroring without any configurations. If you have some non-Samsung smartphones or tablets, it is better to get the Netgear Push2TV Wireless Display HDMI Adapter mentioned above. How about Google Chromecast? Is it work with Galaxy S4 screen mirroring? The $35 Google Chromecast is an exciting, and affordable device. But at this time, Miracast is NOT supported by Chromecast. So, it can NOT be used as an adapter for Galaxy S4 screen mirroring. With the Chromecast dongle, what you can cast on your TV from Samsung Galaxy S4 is limited by the apps that support Chromecast. Anyway, this is not through screen mirroring. Here are list of commonly asked questions on using Galaxy S4 screen mirroring. I update the list regularly. If you have any other questions, please post them in the comments below, or use contact us page to let us know. Q1: I turned on Galaxy S4 screen mirroring, but there are no device found to share the screen. A1: Make sure your TV is on. If you are using an adapter, make sure the HDMI source is set correctly on your TV and you can find some texts like ready to cast on your TV. Q2: Should the smart TV (or the HDMI dongle/adapter) connect to the same network as Galaxy S4 for screen mirroring? A2: No. For Galaxy S4 screen mirroring, a peer-to-peer wireless network between the TV (or the adapter) and Galaxy S4 will be established privately to share the screen. This is independent of other wireless connections. Actually, internet access is not a pre-requisite for Galaxy S4 screen mirroring. This is different from Google Chromecast. Q3: How about Galaxy Note 3? is this guide applies to Note 3? A3: This guide also applies to Galaxy Note 3. You may check this page for more specific issues on screen mirroring on Galaxy Note 3. Q4: Can I turn off the Galaxy S4’s display when using Galaxy S4 screen mirroring? A4: No, you cannot. If you turn off the display on Galaxy S4, nothing will be shown on the TV. TV simply duplicates whatever you have on the screen of S4. To save battery when using screen mirroring, you can disable auto brightness and set a low value of brightness. For brightness settings, you may check this page. Q5: Will the brightness or other screen setting on Galaxy S4 affect the TV when using Galaxy S4 screen mirroring? A5: No. screen or display settings in S4 are only for Galaxy S4. TV will use its own settings as explained in your TV’s manual. They are independent of each other. Hi, I have the Samsung Galaxy S4 mini and I also have the Netgear Push2TV PTV3000. I also have a home theater/surround sound system from Sony. I have used wireless display and miracast before and connect my laptop via WiDi on a regular basis. I am able to connect my S4 mini and the quality is phenomenal. The issue I am having is with the sound. I have sound but the quality is poor and no bass, all treble. It sounds like the system is set to monaural even though it is not. When my laptop is connected the sound is pristine. I assumed that the phone was incapable, but I have a friend that has a Motrola Moto X and his phone was able to play sound perfectly and as good as the laptop. I believe that all the settings on the surround sound receiver are correct, because I have not changed anything and my laptop works and the Moto X worked all with the same settings. I have read most of your tips and guides and I have tried different sound sources and they all came through poorly. Again sound sources from youtube, netflix,music stored on the device, spotify, soundcloud etc. work flawlessly when using the Moto X and my laptop. I have tried additional sources, but I do not believe it is the source of the sound or my surround receiver. Do you have any suggestions for me? I appreciate any help. It could be due to the specs of S4 mini. For S4, I never got any issues. Screen mirroring need a receiver. Both S3 and note 10.1 are senders. They are not receivers. Thanks for your answer Simon, this information is good to know. Would you know about an app that could turn the tab into a “receiver” ? Not sure. Normally smartphones or tablets are considered as small screen so they seldom act as receivers. Samsung has group play (the new one, not the old one) that can partially (limited) share the screen among Samsung devices. But it does not work on your devices. It needs S4 or later models. And it doesn’t work well. Can a laptop act as a reciever? Any software needed? it is a hardware implementation, not just software, as I know. So far, I don’t know any laptops for this. Most laptops are senders (e.g., WiDi). I had a quick question. We have the adapter and hdmi cord and ate using it for Netflix but I’ve noticed there is a bit of lag. To where the audio comes out first them the characters talk after it. Is There a way too fix that. Did you try to update the firmware for the adapter? I use s4 series , n I have LG TV hd but it’s not a smart TV however it does show me option like HDMI 1 or 2 or 3 . I understand I have to buy the adapter n wire , is that cheapest option for me ? For screen mirroring, it is better to get a Mircast adapter (and the HDMI cable to connect it to the TV). You can mirror everything on your S4 to the TV. Netgear PTV 3000 works very well. Please understand the limitations of Chromecast. It is not a replacement for Mircast adapter. They work differently. I have the s5 and a newer Samsung tv. The TV has allshare and has my phone under screen share as allowed. When I hit screen mirror the s5 scans but can’t find my tv. Any suggestions? Yes. The TV recognizes the galaxy, the galaxy scans but doesn’t see the tv. In other words, TV can scan and find your phone, but your phone cannot find TV. This is a bit strange. Anyway, I still think it is probably related to some settings in the TV, not on the phone (on which you just need enable wifi). Yes exactly. I see the model number of the galaxy on the tv but when I hit screen mirror on the phone it scans and finds nothing. I have a Blaupunkt New York multimedia system in my car. I just had a Carphone unit with Miracast installed so that the gps app Waze could be mirrored onto the built-in screen. Besides having some difficulty in having the cell scan and find the Miracast (I’ve even had to restart the phone to get it to work) the bigger issue is that screen mirroring suddenly turns off. Why is this happening and what can I do to prevent it? Miracast is still new. The hardware compatibility and performance are still among some big issues with this technology. When you purchase such devices, you need check with the vendor whether the pair can play together nicely. Our Honda dealer knew that I wanted to mirror Waze onto the Blaupunkt system. The Blaupunkt system was also offered and installed by the dealer. The dealer supplied and installed the Miracast unit. We were their first customers for it so I’m sure there was a bit of a leaning curve. They weren’t much use in explaining how to use the system. It seems to me that the unit has 2 modes: Miracast and something else that has 4 letter and starts with a “D”. I’m still trying to figure out exactly how to get to the Miracast setting because it doesn’t always come up. Another thing that I’m not happy about is that the mirroring unit was plugged in to the AV-2 setting on the Blaupunkt system. When I’m mirroring nothing beside the Bluetooth phone function works – no radio, no MP3, etc. The only way I can listen to music is to get it through the cell phone. Not ideal. If I had know this I’m not sure I would have installed the mirroring unit in the first place. Is there another way it could have been installed so that the mirroring runs in the background and I can still listen to music? I’m not familiar with the system. Maybe, such a feature (simultaneous miracast and radio) is not supported. Anyway, the dealer may have more knowledge on the capabilities of the system. 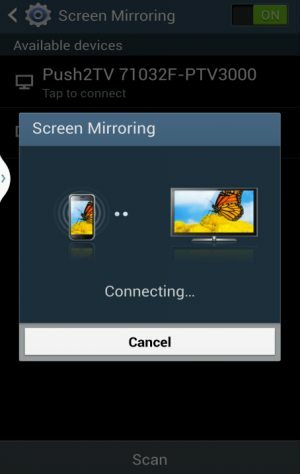 In Galaxy S4, screen mirroring simply transfer the display and audio to the Miracast-enabled device (receiver) through local WiFi network created by the Mircast-enabled receiver. You should be able to play music on S4 when screen mirroring is active. I have a gs4 and a homesync. They were working well together until i received the 4.4.2 kit kat update. Now they won’t connect to each other. I’m hoping there will be some kind of update soon. Any ideas? It seems Samsung didn’t update the firmware for HomeSync for long time. But it should still work with GS4 after kitkat update. Did you update your HomeSync app, and Samsung Link app on your GS4? I’ve got the Netgear Push2tv and a Samsung Galaxy S4 mini. I can connect the 2 with my phone but it won’t go any further. It doesn’t properly connect and then the screen mirroring turns off. I’ve tried the firmware update but still not working. Any ideas? Screen mirroring need two components: a sender (your Galaxy S4 or Galaxy S4 Mini) and a receiver (Netgear Push2TV). You cannot mirror one phone screen to another because both are senders only. Anyway, the normal usage is your plug the Netgear to your TV, then in your Galaxy S4 mini, go to Settings → Connections → Screen Mirroring, and then drag the Screen Mirroring switch to the right. Your Galaxy S4 mini should search for devices in range and should discover the Netgear. Yeah I’ve done that and it says connection made on my s4 mini. But on the tv screen it still searches and says connection not made try again? Reboot you s4 mini and try again. You may also check whether there are any software update for you s4 mini. Strangely enough ive got it working now. I tried to install an Intel Wireless Display update to it. It failed to install it and then the screen mirroring started working straight away. Bizarre. Thanks for your comment. You may try to check whether there are any updates for your phone and TV. For the phone, you need check both system update and Samsung apps update. If no updates, you can try to reboot your phone and try again. Normally,after one failed connection, you should reboot your phone before trying again. Thanks. I have just bought the Samasung smart tv. My wife succeed in connecting but she has Galaxy 3 so I guess that it is not connected to any update for my phone (I use galaxy 4) or TV. If you think it is, how can I check if there is any update for the system/samsung apps? What do you mean by “reboot” – restart? if yes, I have already made it, unfortunately no success. Yes, reboot just means restart. You can check whether there are any firmware updates from Setting–general–about device–software update–update. You can check Samsung apps update by start the Samsung apps. Thanks. I followed your instructions, I clicked “software update” – update – connecting to server – and I received the following message: “your device has been modified. software updates are not available”. Is it OK? Not sure. Probably you rooted or manually flushed the rom before. If your S4 always drop connections, it could be due to some firmware issues. Unfortunately, there are no obvious ways to test. You may check whether your S4 can connect to other Miracast-enabled devices. Most are not. A few latest laptops support midi. Normally, screen mirroring is mainly for smartphone /TV pair. Why does the screen mirroring keeps shutting off in the middle of a movie? Are you using any Miracast dongle? Or does you TV support MiracaST? It could be caused by the Miracast dongle. I need to connect my galaxy s4 to my 2014 galaxy tab pro. They are both senders. What will I need to make my tablet a receiver. I’m wanting to connect to use my cell provider unlimited data to stream netflix for my kids while traveling. My tab is wifi compatible. My cell provider is att, don’t want to switch to mobile hot spot, for this one time use, so I would like to screen mirror. It’s there such a cable that I can connect the two via micro usb: micro usb, or do I need the hdmi dongle (the tab only has a micro usb port). Probably there is no feasible solution for you. Can I stream the directv app on my S4 to a allshare tv? For example, I have a TV set up without a directv cable box but have an app on my S4 to stream live directv. If you can watch the programs on your s4, then, yes, very likely, you can mirror what you can see and hear to the TV. Screen mirroring is local mirroring and is not streaming. You have to use your s4 to connect to the service provider, screen mirroring mirrors your s4 (display and sound) to the TV. This means you cannot use your phone for other jobs if you are watching the TV. I am directly connecting the TV with my S$ but still i face the same issue. What’s the problem? You need a MHL adapter if you want to connect s4 directly to TV’s HDMI port..
First, you don’t need network for screen mirroring. In your S5, tap Settings–Screen mirroring. It will search for any nearby devices. That’s all. Did you get any error messages on S5? it seems your TV does not have screen mirroring feature (Miracast). You may check with the vendor or Samsung support. Most Samsung smart TV has AllShare Play. It can play contents from USB and DLNA devices (for example, S5). But it cannot mirror the screen. I am able to connect my S4 to my Sony Bravia smart tv. But when working, there’s a big delay between device and tv and it runs very slow. When I watch videos, the audio and picture are out of time because of this delay. Any suggestion? There are no settings for this. The problem usually happens when your TV or your s4 is overloaded. You can try to reboot both of them and try again. Hi…pretty niche article…However I am facing an issue I have a miracast supporting dongle and using S4 i9500 it gets connected but then shows an error HDCP not supported to the attached device. Then, you have no choice. You got this error is due to the DRMed content. You can try to unplug the dongle and re-connect it, but most of the time, it will not help. You should disconnect from the device first. Normally, if should be turned off of you drag the slider to the left. It should not turn on automatically. If the problem persists, you may try to reboot the phone. If the screen mirroring is active, you should see the notification icon. Most android devices are senders, not receivers, in other words, most of them can only send their screen, not displaying other screens. I have the same problem as the June 6 writer. The screen mirroring will turn off, but when I recheck it it is back on. I brought it to verizon and they rebooted it, to no avail. I called galaxy who could tell me how to correct it. They sent me a new phone and it is still doing it. Any ideas on how to turn if off so it will stay off? It could be some bugs in the Galaxy S4 firmware. You can try to disconnect it from notification area, not just disable it. Even if it is on, I guess it will not connect automatically. You need always manually choose the device (TV) to connect. That’s a shame. I’m in the same situation. I have unlimited on my phone, and my kids have tablets with WiFi. I could broadcast a Netflix movie to their tablets on long drives (there’s one coming up). This seems like a more reasonable use for Miracast than connecting to a television. I already have computers and cable connected to my screen–connecting my phone really doesn’t make sense (for me, at least). This makes Miracast pretty useless. I’m looking into other possibilities such as MirrorOp. Is there a way, I can Mirror my S4 with another s4 or a samsung tab ?? Probably note, smartphone or tablet are usually designed as the sender, not receiver if Miracast is supported. i have s5 and a dlibg dongle which support miracasr. it shows connecting for a while and then dies not connect at the end. Correction: i have s4 and d-link device. So, your S4 actually can find the D-link dongle and tries to connect to it? You may try to check whether there are any firmware updates for the D link dongle. Does the TV screen change when s4 is trying to connect? what could be the problem please? Sometimes, this is due to some task manager/antivirus apps (all of them are actually not necessary). Another possible cause is the dongle. Try to get a branded one. If you get the error, you may try to reboot the phone and try again. It is a very old old device and it may NOT work with Galaxy S4. PTV1000 is mainly designed for laptops (WiDi), not for Android. I would suggest you to get PTV3000 (which is now usually less than $50 in Amazon now). Screen mirroring through Chromecast is available in s4 (with kitkat 4.4 update) but not s4 mini. You need the support from individual apps. So miracast probably is a better solution for you. I question… when mirroring I get video but no audio. Any solution you got in mind?? You may try to start screen mirroring first, then start to play. You may try to reboot the phone. The problem probably is due to other apps. reboot the your Galaxy s4 mini and try again. You may backup the phone and perform a factory reset. No, both are senders fir screen mirroring. Galaxy s4 and most mobile devices can only be used as senders. Hi, I wanted to know how to turn off the screen mirroring because my phone doesn’t have the on/off switch. On the quick settings, there is an icon for screen mirroring. You can toggle it on and off to turn it on or off. Is it based Miracast? Anyway, Microsoft products may not follow standards well. Hi. 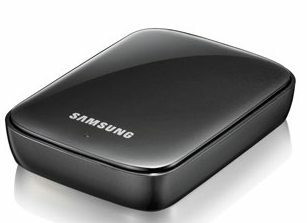 I am planning on purchasing a galaxy s4 and would like to connect it to my tv so I can watch netflix or showbox. .it is not a smart tv but does have hdmi..I do not have wifi at home but have a hotspot on my cell..is it possible to do this using the mhl cable? If you user MHL cable, it’s not necessary to use hotspot. Your Galaxy S4 can mirror everything from the phone to the TV. MHL cable connects TV and Galaxy S4 directly. I have a galaxy s4 and connect to my samsung smart TV but there is no audio help! Checked everything twice and it still isn’t working?! Did you try different contents, for example, playing video saved in your phone? YouTube sometimes may mute the playing when on Miracast. But you can manually turn it on by adjusting volume when video is being played. First, you stop screen mirroring. Play the video on the phone and make sure you can hear the sound from the phone. Then start mirroring without stopping the playing. I have used my Samsung s4 screen mirroring before with no issues, but now all of a sudden the audio no longer works & I can’t figure out how to fix this, any ideas? I tried the information above, but still nothing.